As many of you may or may not know, on my own blog I have frequently challenged the claims of the proponents of the Medjugorje apparitions and have maintained the position that the so-called Medjugorje phenomenon is nothing but a sham. I believe that the alleged-Seers have not on any occasion been privy to a single apparition or vision of the Blessed Mother and that the whole Medjugorje mania is hostile to the true spirit of Catholicism. People often claim that there are so many good fruits that come out of Medjugorje that I am being a fuddy-duddy for questioning it, and I have taken up and thoroughly dealt with this lame "fruits" argument elsewhere. 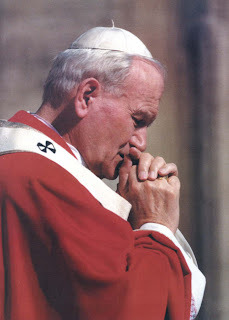 Quote: In 1992 John Paul II told Fr. Jozo Zovko (curate in Medjugorje when the apparitions started and long-time Medjugorje proponent), "Busy yourself with Medjugorje. Look after Medjugorje. Don't tire. Persevere, be strong, I am with you. Watch over, follow, Medjugorje." I'm not sure why any traditionalist would question the so called statements by JP II. After all wasn't it he who let the Barque of Peter run aground in the 70's - 90's and did nothing worth mentioning to right the ship? As to whether or not the Apparitions are true, I'm not qualified to answer. I do not choose to be a part of the Medjugorie phenom. I'll stick with Fatima and Lourdes and other authenticated Apparitions. Regardless, he is the pope, and his official pronouncements do matter. trident59 Wrote: After all wasn't it he who let the Barque of Peter run aground in the 70's - 90's and did nothing worth mentioning to right the ship? This is a gross oversimplification, and borders on being downright inaccurate. Firstly, the Church expanded by leaps and bounds in Africa and Asia. The situation isn't perfect in those regions, for instance there's a danger of too much synchrism and incluration in mission grounds. Nonetheless, this was probably the case in Europe 1500 years ago too. For the expansion of the Church in these areas, the pope is to be commended for his role in said growth. Catholicism can do perfectly well outside of a European paradigm, which is fading anyway for better or worse. Secondly, one of the main jobs of any pontiff is to maintain unity. There was (and is) an extremely real chance of the American and, especially, European bishops breaking from the Church in a formal schism. No doubt there were unfortunate concession made in order to maintain this unity. Female alter servers and the excommunication of the SSPX were direct concession to the America and European bishops, respectively. Nonetheless, an open schism which would last a thousand years, was avoided under Jo. Paul, to his credit. Under Jo. Paul, Western seminaries largely became markedly more orthodox, and many of the excesses of the post-Vatican II Christian world were rooted out, or discredited (e.g. : no one would say after Jo. Paul's reign contraception and Catholicism were compatible). Yes, credit must be given when its due. Personally I think JP II ranks as the worst or second worst Pontiff of the 20th century. However he was very vocal in his fight against abortion, contraception, euthanasia, homosexuality women priests and very supportive of clerical celibacy. Us 'Trads' may not like alot what he did, but I know of many people who became Catholics because of him. I am also eternally grateful to him for the FSSP. StrictCatholicGirl Wrote: The Popes, of course, could hold their personal opinions about certain apparitions and they could be wrong. Neither Pope JPII or Benedict XVI have spoken officially regarding Medjugorjie. "Whispers" and "smiles" do not count! True, and AFAIK the competent authority in the matter, the local Ordinary, condemned it. Unless the Popes authoritatively overrule him, the Ordinary's ruling stands as the Church's stance. QuisUtDeus Wrote: True, and AFAIK the competent authority in the matter, the local Ordinary, condemned it. Unless the Popes authoritatively overrule him, the Ordinary's ruling stands as the Church's stance. My own reconversion was because of Medjugorje and that was 1994. And I went as a pilgrim in 1998 and it was an incredible experience. All that being said, I do not promote Medjugorje at all. The DISOBEDIENCE of the 'visionaries' is what did me in. The local ordinary, in his authentic jurisdiction called the visionaries to silence from the very pulpit at St. James. They never heeded him at all. Instead this bishop is calumniated. this is NOT Our Lady's way at all. Even if the bishop is totally wrong, it does not really matter. What matters is obedience. Padre Pio is a saint now not because of his stigmata but because of his obedience. And he was nearly thrown out of the priesthood and was not allowed public Mass or confession for years and he had to cease being a spiritual director and no longer write his directees. He could have fought it for it was all unjust. But it was also a trial allowed by God. The saint was obedient. The Divine Mercy devotion and message was silenced for decades in obedience to authority. Had those promoters stubbornly kept on, then we would not have had this devotion go worldwide. There is much disobedience in the whole Medjugorje phenomenon. One holy priest has predicted that if the church were to rule negatively, it would cause a huge split for many would continue their disobedience for the sake of the 'Gospa'. The devil wants nothing more than to cause a rift in Mary's children. Obedience is imperative. Our Lady would never condone disobedience and irreverence to lawful Church authority.